Veteran stud master Sir Patrick Hogan has made some pretty astute stallion choices, not the least being Sir Tristram (IRE) and his son Zabeel (NZ), and he looks to have pulled the right rein again with champion sprinter Tavistock (NZ), a dual Gr.1 winner by Montjeu (IRE), who is NZ’s current leading second crop sire and is “book full” this season at Cambridge Stud. ​ BOOM young Cambridge Stud-based sire Tavistock (NZ), a dual Gr.1 winner at 1400m, owes his existence to an aristocratic couple and to a club-footed mare who cost just 2100 guineas at auction. The mare was the remarkable Mrs Moss and the aristocrats were Lord and Lady Tavistock (later the Duke and Duchess of Bedford). “I replied, because he had some of the most famous racing silks in the world and they hadn’t been seen on a track in 100 years,” she recalled when announcing the dispersal of her Bloomsbury Stud stock at Tattersalls in 2010 after 45 years of operation (her NZ stud at Matamata was sold to Michael Tololi in 2007, four years after the Duke’s death). Mrs Moss was a foundation mare for the English stud and the daughter of Reform-Golden Plate by Whistler, who was born in 1969, was purchased in the early 1970s for 2100 guineas and the buyers then tried to return her when she was found to have a club foot. However the sale went ahead and Mrs Moss proved an outstanding broodmare with 11 of her 15 foals winning races. They included the Japan Cup hero Jupiter Island (St Paddy), brilliant juvenile Precocious (Mummy’s Pet) and Queen Mary Stakes-Gr.2 winner Pushy (Sharpen Up), herself the dam of several Group winners. Tavistock’s second dam Pedestal (High Line) is a daughter of Mrs Moss and she is also the second dam of Precedence (Zabeel), a very good and durable stayer for Bart and James Cummings and sixth in the 2014 Melbourne Cup. Importantly, Mrs Moss, who won at two in the UK, was able to impart speed to her runners and her descendants have won more than 450 races, so it’s worth taking note of the words below from a master breeder and trainer of stayers. “In the pedigree of a stayer of classic quality you will nearly always find the name of a horse that was a good sprinter . . . staying power, in order to keep winning, must occasionally be enlivened with the blood of top sprinters over three-quarters of a mile and one mile . . . if the first 62 ancestors of a racehorse (the first five generations), both mares and stallions, all had staying power only, you can depend on it that this horse will never win a decent race over ANY distance,” observed Federico Tesio in his book Breeding the Racehorse. Tavistock, who is by the Arc de Triomphe and dual Derby winner Montjeu and from Upstage (GB), a daughter of English Derby hero Quest For Fame (GB), has this speed element via Mrs Moss. It’s also worth mentioning that Quest For Fame’s grandsire Blushing Groom was a champion at two and is a descendant of Nasrullah. Trained in NZ by Andrew Campbell, Tavistock won an 800m trial in December 2007 and another over 1000m the following February before stepping out in a race for juveniles over 1100m at Masterton on March 1, winning from Juice in 1:04.50. He was second next time out of 1200m on March 15 before a sixth of 16 in the Manawatu Sires’ Produce-Gr.1 behind Il Quello Veloce. Given his chance in Australia with Mick Price at three, he won a 1200m trial at Geelong in August 2008 and then stepped out against the best young sprinters in the Listed Vain Stakes, running second behind Super Boy (Exceedingly Good third) over 1100m on August 16 before winning the VRC Best Dressed Henry Bucks Plate (1400m) from Romneya and Exaltastic on September 6, running fourth in the Caulfield Guineas Prelude-Gr.3 behind Super Boy on September 20, and then failing behind Whobegotyou on a dead track in the Caulfield Guineas-Gr.1 on October 11. Back in NZ at four, he opened with another trial win over 1000m at Otaki in late July 2009 before first-up third over 1200m at Foxton on August 7. His biggest test came next time out in the Mudgway Partsworld Stakes-Gr.1 (1400m) on August 29 and the talented son of Montjeu defeated multiple Gr.1 winner and Horse of the Year King Mufasa, running 1:22.09. Unplaced runs in two Gr.1 events (1600m, 2040m) in September and October followed and he was given another break before stepping out at Otaki on December 22, 2009 to win a 1000m trial. He was back in the winner’s circle on January 1, 2010 winning the Hawkes Bay Best Travel Sprint 1200m (1:10.24), carrying 59.5kg and beating Stravinsky’s Affair. He was unplaced in the Telegraph Stakes-Gr.1 behind Vonusti and then runner-up to fellow Montjeu son Wall Street in the WRC Thorndon Mile-Gr.1 on January 30. He claimed a second Gr.1 next time out when he collected the Waikato Draught Sprint (1400m in 1:21.30) from Wealth Princess and King Mufhasa on a track rated dead, coming, as usual, with a scorching late run from the rear of the field. Sent back to Australia (where he raced as Lord Tavistock), he was fifth to Typhoon Tracy in the MRC Futurity-Gr.1 on February 27. Andrew Campbell next stepped the entire out in the Blamey Stakes-Gr.2 (1600m) at Flemington on March 13 and he came from the back of the pack to mow down Vigor and Dao Dao, running 1:36.37 on a good track. He was retired after running last of seven behind Melito in the AJC T.J. Smith-Gr.1 (1200m) on a dead track on April 10, 2010. Tavistock’s 18 starts had yielded six wins, three seconds and a third and his earnings topped $555,000 and he was rated NZ’s Champion Sprinter of 2009-10. The death of Arc winner Montjeu (IRE) (Sadler’s Wells-Floripedes by Top Ville) at just 16 in late March 2012 was a major loss for his owners Coolmore, and for the wider thoroughbred breeding community. “The sire of three Epsom Derby winners including last year’s brilliant winner Pour Moi (2011), as well as Camelot, the favourite for this year’s edition (subsequent winner), Montjeu was one of the best stallions in the world and in 2011 he sired 15 individual Group/Graded winners in the northern hemisphere, which was the equal of (fellow Coolmore stallion) Galileo,” Coolmore said in a statement at the time of the horse’s death due to complications from septicemia. “Montjeu will best be remembered for his incredible wins in the Prix de l’Arc de Triomphe and King George VI and Queen Elizabeth Diamond Stakes as well as his runaway victories in the French and Irish Derbys (both Gr.1).” Montjeu won the Arc as a three year-old in 1999 and earned a Cartier Award as Champion Three Year-Old Male that year and was top on the International Three Year Old Classification and was the highest rated racehorse (Timeform 137) by the 14-times Champion UK/Ireland Sire Sadler’s Wells and won 11 of his 16 starts for trainer John Hammond and part-owners Coolmore who purchased a 50% share in the horse after he won his only two starts at two in France. He was also Champion Older Male in Ireland, England and France in 2000 and again topped the International Classification (4YO plus, long). “He was a really outstanding racehorse, one of the few outstanding racehorses I’ve ridden,” jockey Mick Kinane said when learning of the horse’s death. “That King George win was pretty good all right. He treated them with contempt that day, and it was just a privilege to be on board. Bred in Ireland by Sir James Goldsmith, who died before the colt raced, he is out of the French Prix du Lutece-Gr.3 winner and Prix Royal Oak-Gr.1 runner-up Floripedes, whose four winners also include Listed winner and Gr.1 placed Le Paillard (Sanglamore). She is also the dam of unraced Cumbres (Kahyasi), dam of the Irish 1000 Guineas-Gr.1 and Moyglare Stud Stakes-Gr.1 winner Again (Danehill Dancer). Another unraced daughter, Cuixmala (Highest Honor), produced the prolific Listed winner and Group placed Mont Rocher (Caerleon). Her dam, Tout Cy (by the Val de Lior horse Tennyson and from Adele Toumignon by Zeddaan), a half-sister to Gr.1 winner Dear Doctor, produced four winners including Gr.2 winner Dadarissime (by Highest Honor, a great-grandson of Zeddaan). To early November Montjeu is credited with 760 winners (64.8% of starters) of more than $139m. His 116 stakes winners represent 9.9% of starters. He has 101 winners of $23.62m in Australia (20SW) and 82 winners of $5.1m in NZ (10SW) from a brief shuttle career to NZ. His progeny’s winning distance index is 2302m. His major winners include six-time Gr.1 winner St Nicholas Abbey (Sure Blade), Fame and Glory (Shirley Heights), whose five Gr.1 wins include the Irish Derby, Wall Street (Grand Lodge), four Gr.1 wins, Hurricane Run (Surumu), four Gr.1 including Arc de Triomphe and Irish Derby, young Coolmore shuttler Camelot (Kingmambo), four Gr.1 including English and Irish Derbys, 2000 Guineas, Joshua Tree (Grand Lodge), Canadian International-Gr.1 (three times), Authorized (Saumarez), a former shuttler whose three Gr.1 wins include the English Derby, Scorpion (Law Society), Jukebox Jury (Kenmare), Leading Light (Gone West) and Melbourne Cup winner Green Moon (Green Tune). Familiar names in the pedigrees of dams of his best winners include Sharpen Up, Danehill, Grand Lodge, Shirley Heights/Darshaan, Nijinsky and Kemnare. Tavistock’s unplaced dam Upstage has had six named foals and all are winners including fillies Kabuki (Shinko King) and Inertia (Danasinga), the last named being dam of 2YO winner Velocity Miss (Mutawaajid), a filly inbred 3mx3m to Danehill and 4fx4f to High Line. Upstage’s sire is English Derby-Gr.1/Hollywood Turf Handicap-Gr.1 hero Quest For Fame (GB) (Rainbow Quest-Aryenne by Green Dancer) who did such sterling service for the Ingham family at Woodlands, leaving champion juvenile Viscount (dam by Sir Tristram, sire), Dracula (Kaoru Star, sire), Unworldly (Danehill), Tributes (Dalmacia) and De Beers (Danehill, second dam Sir Tristram) among a host of talented performers. Pedestal (by Hyperion grandson High Line, twice winner of the Geoffrey Freer Stakes-Gr.2 and three-times winner of the Jockey Club Cup-Gr.3), second dam of Tavistock, raced once and left four winners from nine foals and her daughter Kowtow is the dam of Precedence (Zabeel) winner of $2m including the Moonee Valley Gold Cup twice, fourth in an Australian Cup-Gr.1 and sixth in the 2014 Melbourne Cup as a nine year-old for Bart and James Cummings. As mentioned earlier Mrs Moss left 11 winners from 15 foals, the best being the Japan Cup-Gr.1 winner Jupiter Island and Gr.2 winner Pushy (a successful broodmare). Several Mrs Moss daughters became stakes producers including Mrs Moonlight (dam of Soviet Flash) and Putupon (dam of Danceabout). Golden Plate (Whistler-God as Gold by Nimbus) dam of Mrs Moss, is a sister to the brilliant National Stakes winner and short-lived sire Whistling Wind, one of the fastest British juveniles of 1962, while Tavistock’s ninth dam Cresta Run (Hurry On-Bridgemount by Bridge of Earn) won the English 1000 Guineas in 1927. This branch of family 14b traces to Park Hill Stakes winner Adula (Gallinule), Tavistock’s 14th dam. Adula’s dam Admiration (Saraband) had a pretty good thing going with Gallinule as Adula’s siblings include the “peerless” Pretty Polly (Oaks, 1000 Guineas, St Leger), a wonderful foundation mare (14c) found in many modern pedigrees, especially via Nearctic; Miranda (descendants include Gratitude, Tehran, Bagdad); and the Coventry Stakes/Criterion Stakes winner Admiral Hawke. 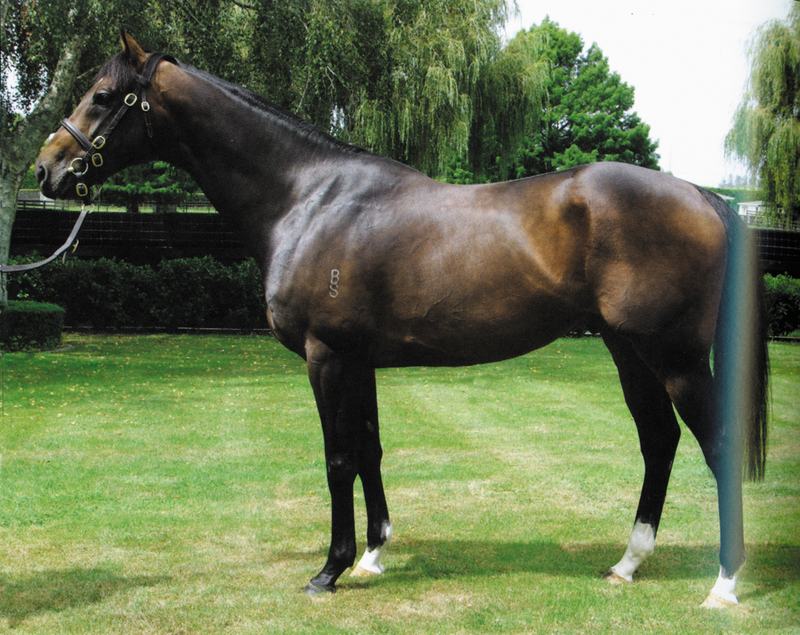 With this family background it isn’t surprising Tavistock has made such a bright start to his stud career and was the third ranked first season sire in NZ in 2013-14 with three winners and is currently leading the NZ second season sires’ table with four winners of six races (2SW), with a lead of $80,000 over Thewayyouare. He has 10 winners and seven placed runners (29 starters) of more than $450,000 from his two crops to race including two stakes winners Volkstok’n’barrell (Volksraad), winner of the Bonecrusher Stakes-Gr.3 and triple Listed winner Avisto (Exceed and Excel), who provided their sire with a stakes double at Ellerslie on September 27, as well as the Gr.3 placed Diamond Valores (Zabeel), Gr.2 placed Longchamp (Danehill), Listed placed Imperial Lass (Zabeel) and Midnitemagicman (Keeper), as well as winners from mares by Mozart, Centaine, Grosvenor, Zabeel and Tale of the Cat. The Zabeel cross is an interesting one as Sadler’s Wells (grandsire of Tavistock) and Nureyev (damsire of Zabeel) are three-quarter brothers, both being sons of Northern Dancer and with Sadler’s Wells being from Fairy Bridge (Bold Reason) a daughter of Nureyev’s dam Special (Forli). Volkstok’n’barrel has won two of his three starts and had 4.25 lengths to spare over runner-up Passing Shot in the Bonecrusher-Gr.3 at his most recent outing, while Avisto’s Listed win on that day was her third stakes win in succession. Tavistock has had three winners from just five runners in Australia, the latest being Margin Trader, who won on debut at Bendigo for Mike Moroney in late October and has been returned to NZ for a tilt at the NZ Derby, a race he will contest under his original NZ name of Bellagio. Margin Trader joined this season’s stakes placed winners Diamond Valores and Imperial Lass (a $125,000 Karaka buy for Peter Moody) on Tavistock’s Australian honour roll. Tavistock’s 2014 fee is listed as $NZ7000 plus GST and his book was closed in early October following a flood of applications on the strength of his stakes double a few days earlier. His first crop three year-olds are going great guns this season so there’s every reason to expect his record to be even better by the end of the season and, given the promise shown by his runners in Australia, his yearlings are sure to be in demand at Karaka 2015.